A new free newspaper is hitting the streets of a South London district this week after £5,000 was raised to get it into print. 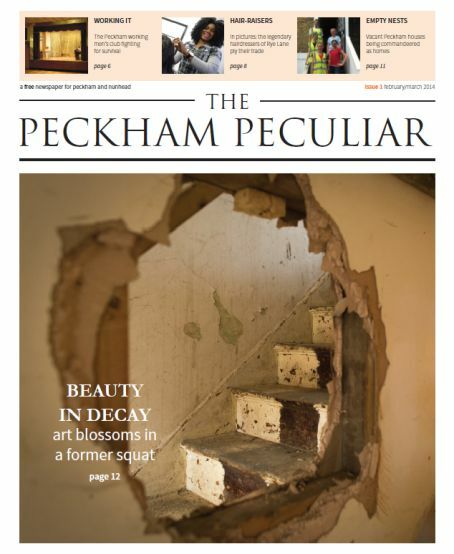 The 16-page first edition of the Peckham Peculiar will be launched tomorrow and the title is set to be published every two months after that. Its launch comes after £5,000 was raised in donations from 150 local residents and businesses through funding platform Kickstarter, which will go towards the first two editions. The print run for the first edition is 8,000, of which 6,000 will be distributed to homes in the area and the other 2,000 will be available to pick up in places like bars, restaurants and train stations. Mark McGinlay, one of the four co-editors, said: “We want to be inclusive. We want to appeal to the whole area, not just hipsters and young people. He added he wanted the newspaper to reflect the diverse culture in the area. The title includes news stories and photographs and also features a crossword and a recipe. Along with the 8,000 regular editions, there are also 300 copies of the newspaper which have been published with a limited edition front page, designed by local artist Jake Tilson. A blog will also be launched on the same day the paper hits the streets and online editions of it will be available to view. The title is led by the four journalists who are co-editors and around 11 people in total have contributed towards it being launched. A newspaper every two months.That will be topical then. Is it going to be another The Guardian but without the subsidy? Note to Tindle/SLP – this is how you do hyperlocal! Any new publication deserves encouragement…at least for the experience it gives for those who produce it. Those who disparage it are not true journalists and should be ashamed. Great title and a simple but effective picture use. Good luck to the “Peculiar…” and may the particular people of Peckham ponder greatly on its peculiar platitudes…..
All thanks to having a vision, lots of hardwork, great team of helpers and some amazingly supportive local businesses. Clearly I’m biased (and proud!!!) but I think it looks a lot more professional than some of the national papers. I know how exciting this is. I launched my own magazine in the mid-nineties which ran for five issues and nearly got taken up by a couple of the big publishers. There’s something intangible (yet tangible, if you see what I mean) about the appeal of paper publications in this electronic age. have one. The Peckham Peculiar will provide a much needed mouth piece, will be a boost for local businesses and be another piece in the jigsaw which makes Peckham a special place to live.